For several years one or two terns had summered at Little Marlow Gravel Pit and attempted to breed on the main island, but often failed. Having seen tern rafts used successfully at various other sites, a small group of Little Marlow regulars decided to try a raft at the site. We managed to acquire a partly built raft from a local company, the raft having been used for a charity, "everyone gets wet", raft race on the Thames the previous summer. The raft consisted on an 8'x4' piece of marine ply-board to which eight polythene drums had been strapped. By adding sides and corner posts, plus some wire mesh, the raft was almost complete. After floating the raft in the water we added a layer of gravel and attached several anchor chains. 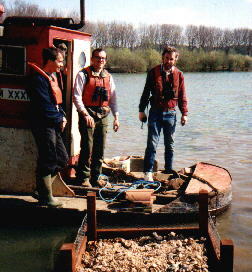 On 30th April 1994 the first raft was launched with the help of staff from Redland Aggregates (Now Lefarge Aggregates) who used their tugboat to tow the raft to the middle of the lake. Within an hour of leaving the raft a pair of the newly arrived terns landed on the raft and soon made it home. On about 9th June 1994 two young were hatched and went on the fledge successfully. 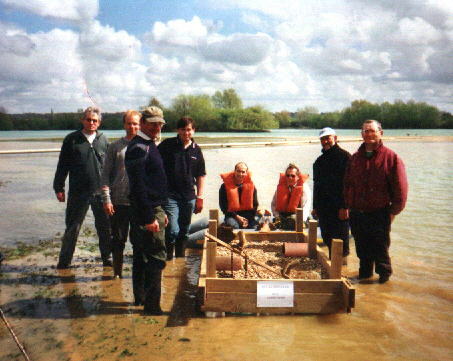 In early May 1995 the original tern raft was re-launched along with a second purpose built model. The launch was again assisted by Redland's staff and this time a pair of terns bred on each of the raft although only three young were raised. On 17th June Mick McQuaid ringed the three tern chicks, one of which was recorded at Seaforth Nature Reserve, near Liverpool, on 16th June 1996. Apparently the ring number was read as the bird was perched at close range. It is nice to know that at least one of "our birds" reached adulthood. On-tow - 8th May 1995. Before the Common Terns, Canada Geese and Cormorants turned it partly white! Despite erecting wire mesh around the edge, Canada Geese can usually manage to get aboard. Sometimes territorial disputes occur but at other times the co-habit peacefully. 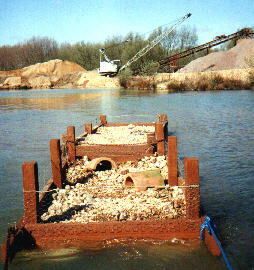 In 1996 the pair attempted to breed on both tern rafts and also on a moored barge which is normally used for moving gravel. One of the pairs on a raft failed but the other two pairs were successful. 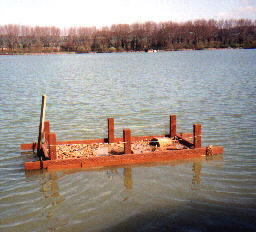 During 1997 a pair bred on both tern rafts. In 1998 four pairs were present with a pair on each of the two rafts, a pair on a small island and a pair which apparently did not attempt to breed. This may well have been due to aggression from the pairs in residence as they were seen to be very territorial. 1999 saw seven pairs settling down to breed on two rafts and on a small island, with the number of fledged birds well into double figures. For 2000 a third raft was built, with the original raft making it's last appearance as it's now fragile state will probably only just see it through the summer. A ringing party on the 17th June found that two rafts had supported three pairs each and the third raft four pairs. The total number of fledglings was ten, which were all ringed, with ten eggs yet to hatch. It is thought that a pair of Canada Geese that raised a brood on one raft delayed the Terns for a while thereby leaving six eggs unhatched on that raft alone. The picture shows the team of volunteers who turned out to help with the launch of the rafts. From left to right Dave Parmenter, Rob Andrews, Alan Stevens, Tom Perrins, Mike Wallen, Chris Bullock, Danny Davis and John Sweeney. Jim Rose behind the camera. Autumn 2000 saw the original raft fall to pieces when lifted from the water. 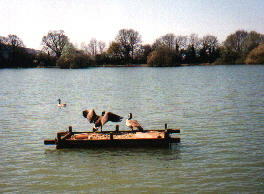 This left just two sea-worthy rafts for the 2001 breeding season. The newer of the two rafts was improved with a wire mesh around the sides to prevent the chicks jumping overboard. Both rafts were launched in early May. Several pairs of Terns occupied both rafts, one bird sporting a ring on it's right leg. Alan Stevens managed to read most of the ring when the bird was perched fairly close and we await a reply from the BTO as to it's origins. One thing we know is that it was not ringed at Little Marlow. On 25th June Chris Bullock, Mick McQuaid, Mike Collard and Jim Rose took on what is now the annual task of ringing the Common Tern chicks at Little Marlow GP. 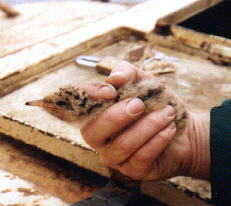 Eleven chicks were present on the first raft of which ten were ringed. One had rather short stumpy legs and was left unringed. It was considered to be abnormal rather than an Arctic Tern!! There were also two eggs. The second raft had three chicks, one of which was ringed, the others being left unringed, as we had no more of the correct size. This raft also had one small dead chick and we know at least one chick had been taken by a Crow. 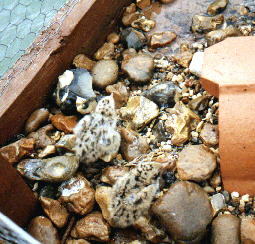 The total number of chicks hatched as of 25th June was therefore at least sixteen. This space left for pictures to be provided by Mike Collard - Hopefully!